John Leech Gallery was established in 1855 and with more than 150 years of business, boasts an impressive exhibition history. Throughout its history the gallery was in several Auckland locations and it continually adapted its practices to stay current in an evolving art market. Reflecting the gallery's dedication to promoting quality art, the gallery represented a stable of contemporary artists from Australasia and was a market leader in works from the secondary market. Exhibition highlights include Frances Hodgkins (2010), Pacific Collections (2010) and I Dream of Snow Falling: Ralph Hotere (2007). John Leech Gallery published several exhibition catalogues, many of which can be seen here. In 2011 the Gallery closed its main exhibiting space and its Heritage Collection can now be viewed by appointment in our inner city Auckland premises. Director John Gow is a specialist in New Zealand Art with expertise in historical artworks and indigenous objects. With more than thirty years’ experience he is well regarded locally and internationally, and is the co-author of several books on historical art including Out of Time (2006) and Crombie to Burton (2010). He provides his expertise to Public and Private collections, both locally and abroad. He is currently a member of the Northern Club Art Committee and member of the McKelvie Trust Board which manages the bequest of the McKelvie Estate to the Auckland Art Gallery. 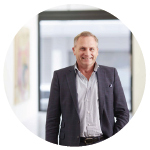 He also sits on the Spark Art Trust which owns and oversees the Spark art collection, and the Britomart Arts Trust.